Make the changes you want and see results that make a difference. You can easily eliminate sabotaging behaviours, beliefs, and emotions online with the help and support of Anne, a compassionate and experienced Counsellor. Becoming more happy, fulfilled, balanced. 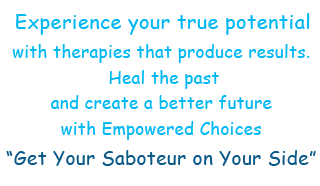 Stop sabotaging yourself! Have you ever wondered how it would feel if you could resolve painful or traumatic experiences from your past? Even the habits and phobias we pick up through life’s journey can limit us from reaching our potential in happiness, in our relationships, and in loving ourselves. Imagine what being free from these limitations will allow you to do. You can feel more confident, calm and peaceful, happy, you can make good choices for yourself, have good relationships, improve your health, enjoy your life. Ultimately you can be free to live your life the way you’ve always wanted. Working with Anne means having access to a variety of healing methods delivered in personal sessions. She specializes in working with people to resolve emotional eating and weight loss, unwanted habits, self sabotage, grief, depression, anxiety, and phobias, to list only a few. Working on yourself means finding a therapist who’s trained and experienced. Therapies that Anne uses include Neuro Linguistic Programming (NLP), Time Line Therapy™ (TLT), Hypnotherapy, and Emotional Freedom Techniques(EFT). She also applies Regression Therapy, Parts Therapy, Conversational Hypnosis and other solution based treatments to make real, lasting change. Change negative emotions, limiting beliefs, and bad habits using EFT, NLP, and Hypnosis with a compassionate and experienced Counsellor. Get Your Saboteur On Your Side. To find out if these results-based therapies are for you, all it takes is a call or email to Anne and you can determine if you want to work with her. Anne helps clients move through personal challenges to being more fulfilled, balanced, happy, healthy and at peace with themselves. Sessions are in a one-to-one format, (except for couples) and are between one to two hours in length. Please inquire for rates and location. Gift Certificates are also available. See below for more information on each of the types of therapy, and the conditions you can change.